Ensure your article is a good fit for the journal. 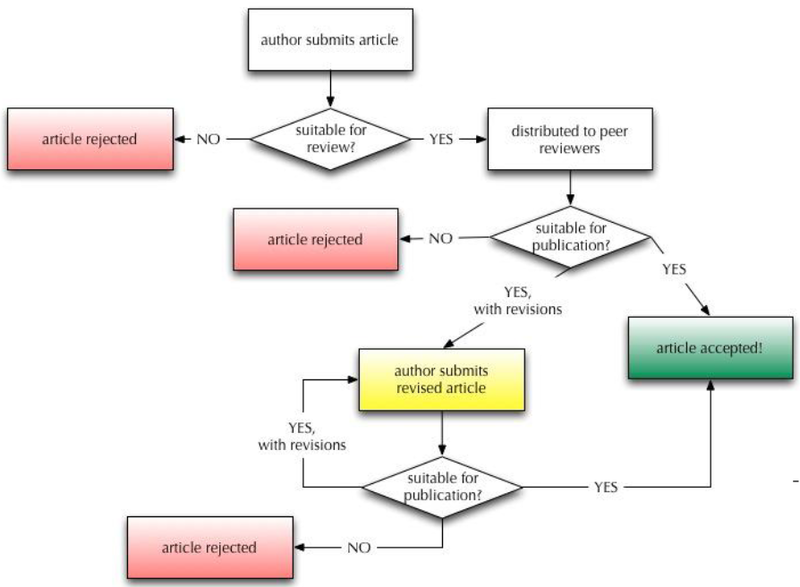 It is considered bad form amongst academic publishers to submit an article to multiple scholarly journals at the same time; instead, the expectation is that authors only submit an article to one publisher at a time, and you will need to find out if your article has been rejected by a publisher before you can submit your work to another journal. SCImago Journal Rank (SJR): "measure of the scientific prestige of scholarly sources: value of weighted citations per document"
Source Normalized Impact per Paper (SNIP): "measures contextual citation impact by weighting citations based on the total number of citations in a subject field. The impact of a single citation is given higher value in subject areas where citations are less likely, and vice versa." Citations: "displays the total number of citations the selected journals receive over the course of each year." Documents: "sum of documents published in the serial title in the 3 years prior to the year the metric." Percent not cited: "provides the percentage of all documents that did not receive citations in that year." For assistance with searching Scopus, please contact the RRU librarians. What is the journal's scope and focus? Has the journal recently published an article similar to yours? If so, it's unlikely that the journal will want to publish another similar article in the near future. Is the journal planning a special issue on your topic? Will the requested word or page count accommodate your discussion? What is the journal's expectation regarding copyright? Number of quotations in the article? Number of citations? Does the article have figures/tables? If so, how many? What is the style and tone of the article? Formal? Informal? Is the style similar to your writing style? What voice does the author use? Third-person objective? First-person formal? How broad is the scope of the article? If the article argues a position, how much of the article is spent considering alternate positions? Using your favourite search engine, search using your subject discipline and “impact factor” or “acceptance rates”. The results should provide options that will display various journals' merit ranking. For example, searching “social science and acceptance rates” will bring up journals in the social sciences and information related to their relative importance. Keep in mind that the higher ratings usually equate to lower acceptance rates - that is, the more prestigious the journal, the harder it is to get an article accepted for publication. When you're considering which journal to submit your article, think about your goal for the article - it might be worth submitting to a journal with a lower ranking if it means that you have a better chance of getting published. "Overview of scholarly publishing options"
"How are SCImago Journal Rank & Source Normalized Impact per Paper calculated?" A tool to help authors find Elsevier journals to target for manuscript submission.